When putting in a full day of roller skating, customers need something to eat or drink so they can refuel to keep up their momentum. Serving food is another way for FEC or skating rink owners and operators to meet a need for their customers so they don’t have to go elsewhere when they get hungry or thirsty, while also adding another revenue stream to their facility’s bottom line. Breanna Morris, snack bar and party director, and Steven Southerland, vice president of operations, Searcy Skate Family Entertainment Center, Searcy, Ark. The center has a complete kitchen with an oven and a fryer. 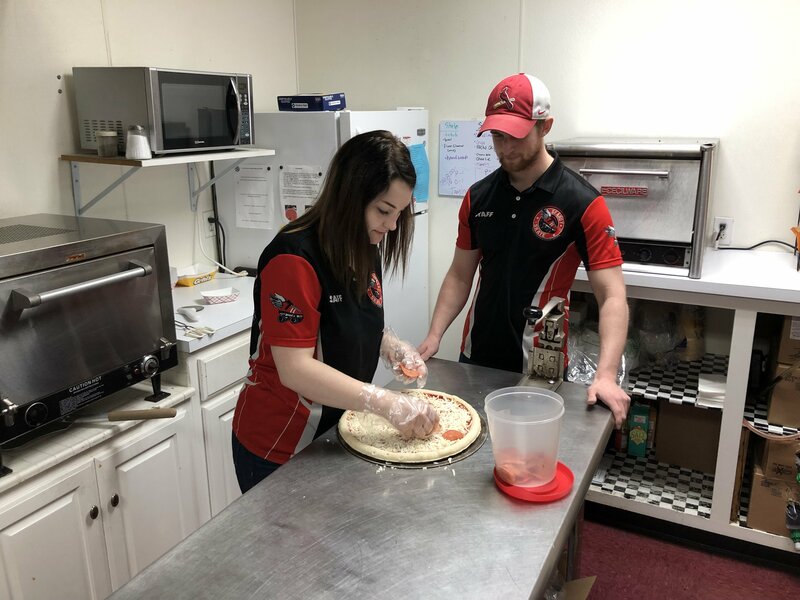 Dean Hohl, owner of Xtreme Wheels in Crystal Lake, Ill., said he is always open to new ideas when it comes to food service at his rink. Big Wheel Roller Skating Center in East Stroudsburg, Pa., has a similar issue with limited space. “We call our food area our Snack Bar. We serve pizza, pretzels, hot dogs, popcorn, nachos, chicken fries, curly fries, funnel cake, churros, cookies, and fountain drinks. We also have vending machines that sell candy,” explained Jodi Warner, manager. “It’s working for us, so we’re leaving it as is. We don’t have a whole lot of room for expansion. If we expanded and added something, we’d have to remove something else from our operation that’s already selling. 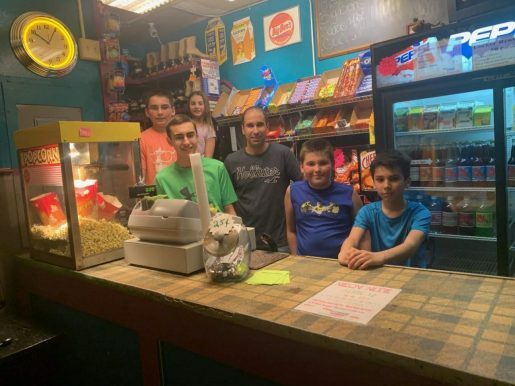 Besides the food, we sell a lot of ‘stuff’ at our snack bar, like novelty items for kids—a lot of glow items, and that takes up space, too.” Warner said everything at their Snack Bar is popular, but pizza and popcorn are their biggest sellers. John Shigo, owner of The Strand Roller Rink in McAdoo, Pa., photographed at the snack bar with his niece and nephews. This very small rink is run mainly with family members helping out. 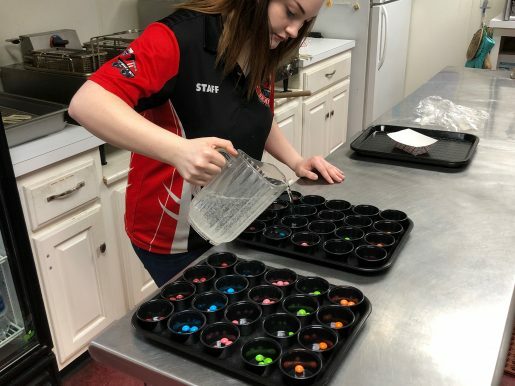 Searcy Skate Family Entertainment Center Snack Bar and Party Director Breanna Morris making Skittle Pops, which involves placing Skittles in cups, filling them with Sprite, and freezing the mixture. Owner Ron Dillow said kids love the concoction. Shigo said they do add new candy; Oreo Cookie Bars were the last new item added. Dillow changes his menu occasionally. “We work with our food vendor to see what the next hot item is going to be. We will order different items during the year to test and then based on performance and margins, we might make it a regular item to our menu,” he said. “This also goes for under-performing items. If an item isn’t selling, we will remove it.” Hohl said he tries to add a new item at least once a year. “We look for something that we can sell a lot of and have a better profit margin rather than a gimmicky product,” he said.